This is a typical cake. The Cake is the seventeenth part of the evening meal, Dinner. It comes after the Pie, the sixteenth part, and before the Collapse, the point at which those eating the evening meal cannot eat any more and thus pass out. 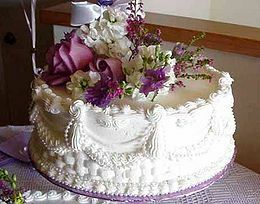 A normal Cake is made out of sugar, flour, molasses, and tears, which are what make it rise when baked, though amounts and other things out of which it is made vary by the time of day. This page was last edited on 22 July 2018, at 22:00.